I’ve been living here now for just over a year, and I can’t believe the amount of plastic that is being used, especially at grocery stores. We usually bring our own reusable bags when we go shopping, but 99 out of 100 other people don’t, at least not where we shop. Even gallons of milk, with a perfectly fine handle to carry, are often double-bagged (or triple!) because the cashier or bagger thinks the milk is too heavy for just one bag. It doesn’t even occur to them that the customer could just as well carry the jug by its handle. The other day we went to K-Mart to buy a six-pack of half liter bottles of Coke for our road trip. The pack had a beautiful strong handle to carry them, but the cashier still tried to double-bag them before we stopped her. What a waste! Sometimes it’s even impossible to not use the plastic bags. Many grocery stores have baggers at the end of every register that start bagging your stuff before you have a chance to hand them your reusable bag. And places like K-Mart and Walmart often have one of those carousels full of plastic bags at every register that cashiers drop the stuff in, making it impractical to use your own reusable bag because there’s simply no space to put it. 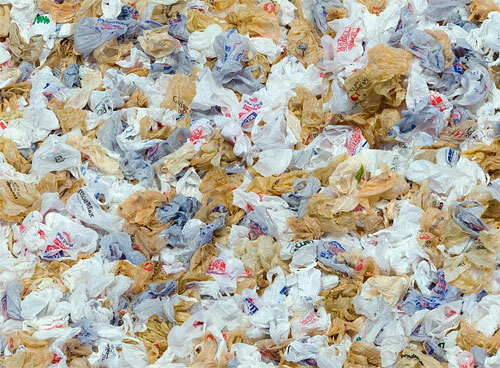 According to reusablebags.com, the people of this planet use over 500,000,000,000 (500 billion) plastic bags annually, or almost 1 million per minute! One million new bags a minute?! That’s hard too imagine. According to the Wall Street Journal, the United States alone uses 100 billion annually, which cost the country an estimated 12 million barrels of oil to produce. When we lived in Holland we would occasionally drive down to France to do some grocery shopping for things we couldn’t normally get, at mega supermarkets like E. Leclerc or Carrefour. Until a few years ago they were using plastic bags everywhere. They would give you a hundred for free if you wanted to, packing just a few items in each bag. Every family was leaving their local supermarché‎ with their purchased goods in a ton of plastic bags. Then all of a sudden the government passed a law to tax plastic bags. The next time we visited the country every single French shopper was carrying their re-usable bags into the store. It was an amazing transformation, but it was like it had never been any different. It is that easy! Back in 2001, Ireland was the first nation to tax plastic bags as a way to stop them from littering the countryside. Before the tax, every Irish man, woman and child would use an average of 300 bags per year, a total of 1.2 billion per year for the country. Besides generating more than $175m for the government, the 7-year-old tax has reduced the country’s use of disposable bags by 90%. Apparently that is not yet enough, because this week the Irish government announced it is doubling its tax from 22 euro cents to 44 cents per bag. France and Ireland are not the only countries that are taking measures to push consumers to use more eco-friendly products. Belgium enacted a “picnic” tax in 2007, which includes saran wrap and aluminum foil. Earlier this year, even China banned stores from giving out free plastic bags! Obama promised change and the environment is among his to priorities. So what about a federal tax on plastic bags, or at least encourage states to implement one? Sure, in the beginning people will be outraged, but before they realize they’ll be walking from their car to their local Piggly Wiggly with a nice reusable shopping bag. We’ll save millions of barrels of oil each year and 100,000s of sea turtles too. This entry was posted on Wednesday, September 30th, 2009 at 9:06 am CET and is filed under Environment, Life in America	with tags . You can follow any responses to this entry through the RSS 2.0 feed. You can leave a response, or trackback from your own site.